38 MR. LINCOLN "You are perhaps right...the most important part is the place where my eyes and heart were heaviest...It is rather for us to be here dedicated to the great task remaining before us, that from these honored dead we take increased devotion to the cause for which they gave the last full measure of devotion; that we here highly resolve that these dead shall not have died in vain; that this nation under God, shall have a new birth of freedom; and that government of the people, by the people, for the people..." Eleven children rush on stage. IN UNISON "We have heard enough." 3RD READER (to audience) "Ladies and Gentlemen...this is what most adults fear, that our children will overhear. Our children are the Council of Ages." 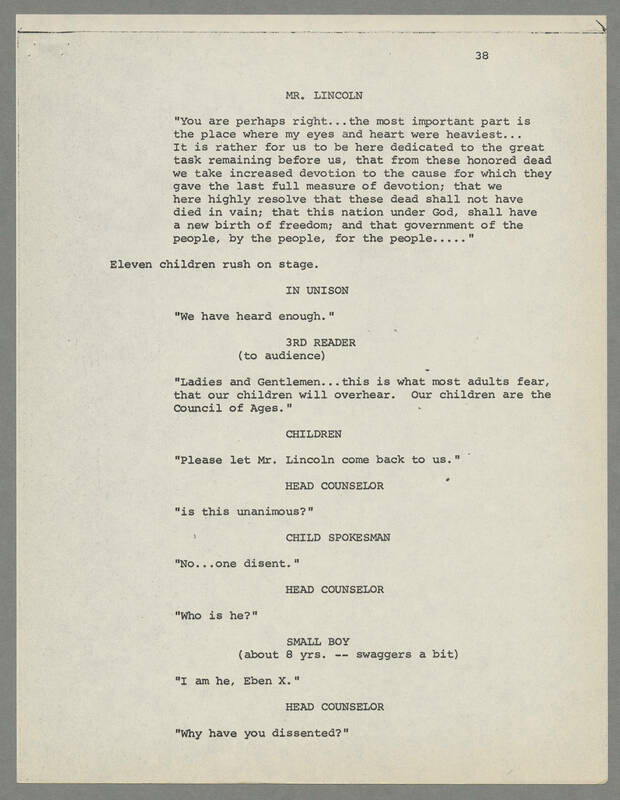 CHILDREN "Please let Mr. Lincoln come back to us." HEAD COUNSELOR "is this unanimous?" CHILD SPOKESMAN "No...one disent." HEAD COUNSELOR "Who is he?" SMALL BOY (about 8 yrs. -- swaggers a bit) I am he, Eben X." HEAD COUNSELOR "Why have you dissented?"